Layla Atkinson and her team at Trunk have created an impressive labour of love for folk legend Shirley Collins's Pretty Polly. 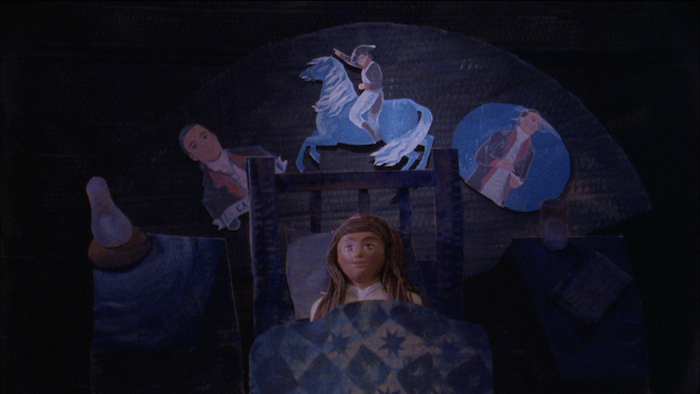 Shot on film over two days with a locked-off camera and no edits or cutaways (during the hottest September weather for a century), this handmade piece of puppetry has too many moving parts to comprehend. A wonderfully authentic feeling handmade show with painted sets, creative use of lighting and charming use of traditional 'Jig Doll' puppets. And that's perfect for Collins' version of an 18th century ballad from the Appalachians. As this behind the scenes video illustrates, Atkinson and her team have delivered a very complex piece of work, and yet made it look so simple. "Putting all your eggs in one basket and stepping off a cliff while exhilarating is also quietly terrifying. My initial thoughts were to shoot the puppets on green screen then add in the backgrounds using After Effects but the prospect of spending a chunk of the summer sitting in a hot room, staring at a screen and trying to key out puppets and then creating "handmade" artwork in Photoshop did not seem that enticing. After listening to the song a couple more times I gratefully ditched the green screen idea and, inspired by the timbre of Shirley’s voice and the stripped back music, decided to create something different. "I wanted to use rough cardboard and simple drawings inspired by American folk art combined with beautiful lighting to form the video’s aesthetic handwriting. I then decided to make my life harder still by keeping the camera locked off at all times and shooting scenes in real time with no edits or cutaways so the final piece would feel more like watching a play than a film. "I knew it would be a bit of a nightmare and a challenge, I did constantly wake up panicking at 4am wondering what an earth was I thinking to attempt something like this, but had faith in the people around me. It was brilliant to be torn away from the computer and to get to work with my hands again, to constantly problem-solve, to be covered in paint and to finally see how everything came together." Two of Trunk's directors team up to collaborate for the first time here for the 25th anniversary of Julian Lennon's Saltwater.